One lovely person nomintaed me for a "One Lovely Blog Award"
First of all, it means a lot to me that someone whom I’ve never met in person, someone who follows my blog and has a wonderful blog herself, considers Sweet Tea and Skyscrapers a favorite. Second of all, I think the “One Lovely Blog Award” is great because it gives us all a chance to find and follow new blogs that we may not have discovered otherwise. When I started this blog, I thought it was going to be about my adventures in becoming a “grownup.” I had just started a full-time job in a new city, and I was excited to share my experiences, life changes and travels with cyber-space. However, the more I blog, the more I realize my blog doesn’t fit into just one category. I find myself writing about anything and everything that I do, that I love and that I experience. Whether it’s a new restaurant or new recipe, a favorite vacation spot, a life-changing event, or a party I’ve hosted, I enjoy sharing my life with others and hope someone somewhere out there can relate in one way or another. Though it’s tough to find the time to blog as much as I would like to, I thoroughly enjoy putting my thoughts into words and keeping an online journal, if for no one else, for myself. I’ve recently made a promise to myself to start blogging at least 2-3 times a week, so to any of my new followers (well, all of my followers), brace yourself. I have a list of posts coming your way! Acknowledge the lovely person who nominated you. Share 7 things about yourself. Anything at all! My name isn’t a family name, nor does it have a really cool meaning. 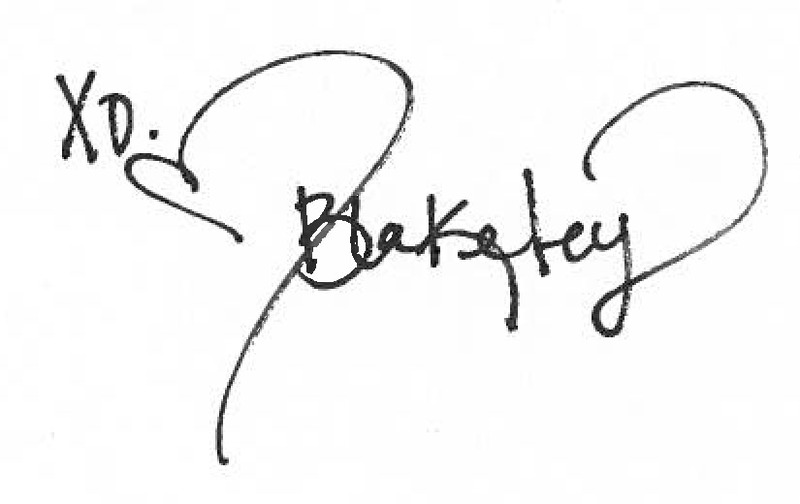 My mom used to live across from a Blakeley Street in Savannah, GA and thought it would make a great name. So, here I am! I can blow spit bubbles from my tongue. It’s my one true talent. If I could choose any other talent, I would love to be able to sing. I can listen to music for hours upon hours without tiring. Any genre, any style. I love the sound of instruments playing harmoniously together, the ways that different voices blend to create one unique sound, and the way that so many lyrics feel like they were written just for my life. I’m that person on a road trip that doesn’t want to talk – I want to listen to music and sing at the top of my lungs. It might not sound pretty, but it feels good and makes me happy. I LOVE pictures. I love taking them, printing them, hanging them, posting them, scrapbooking …. just having those memories in front of you for life is incredible to me. I also love crafting, painting, drawing, organizing and decorating. I’ve secretly always wanted to be a kindergarten teacher. I love my career field and love what I do, but if ever given the opportunity to make a difference is so many children’s lives, I’d take it. I’ve never been out of the country. Or to the west coast. In fact, I don’t even own a passport. That needs to change ASAP! I am the happiest, luckiest girl in the world. I’ve found my soulmate, have great friends, come from the best family, have the sweetest dog (and sometimes, cat), and I wouldn’t change one thing about my life. Go ahead … Check them out and follow ’em! Don’t forget to check out This Florida Life, too!